One of the grand epiphanies I had when I started cooking and baking was that I never needed to be a slave to my cravings anymore. That is not to say I never had to give in to them, oh no. On the contrary, it meant I never had to be worried that my cravings would go unfulfilled (unless we are talking about a craving for chanterelle mushrooms, fresh figs, or Le Pain Quotidien’s hazelnut praline spread, then I may just be out of luck). It’s actually quite liberating, for someone who had never felt the joy of creating one’s own sustenance before, to feel that all of a sudden so much gustatory satiation was within your grasp. The possibilities were, and still are, endless. To this day, it never fails to thrill me when I feel like having something, say Dutch oliebollen or a particular salad I had at a restaurant, and I think — “maybe I can try making it…“. And then I do. And then I realize that nothing (well, almost nothing) will ever be a restaurant or a plane ticket away. That my friends, in my book at least, is a very compelling reason to get into the kitchen and start cooking! So when the weather turned gloomy over here, and I had a sudden yearning for some nice, warm, bursting with fruits pie, satisfaction was not long in coming. – Roll out the dough between two sheets of parchment paper. When rolling, turn dough over frequently and lift the parchment so it doesn’t form creases. When about 1/8 inch thick place in the fridge to chill for about 20-30 minutes. – Mix all the fruit in a bowl with the 2 tablespoons cornstarch, 1/3 cup sugar, and the lemon juice. Set aside. – Mix the 1/2 tablespoon cornstarch with the 2 tablespoons sugar and set aside. – After the pie dough has chilled, place in a 9-inch pie pan. Trim the edges. Return to the fridge. – Gather the rest of the dough and roll our once more. Using a 2-inch diameter round cookie cutter cut the rest of the dough into circles**. – Take the pie pan out of the fridge. 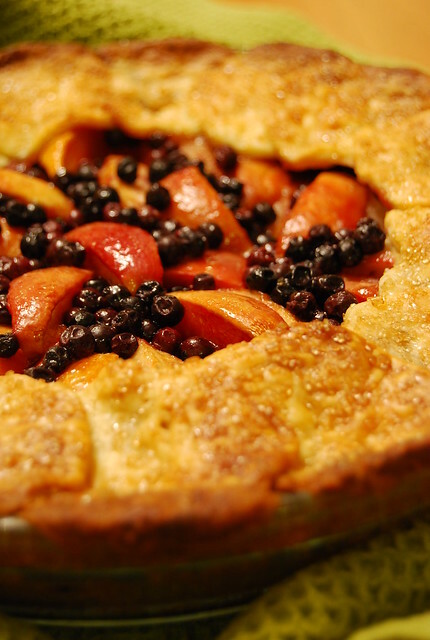 Sprinkle the cornstarch/sugar mixture on the base of the crust and arrange the fruit on top of this. Dot fruit with the butter. Line the border of the pie with the dough circles, overlapping them as you go. Press edges to seal. – Brush the pastry with the egg and sprinkle demerara sugar evenly over both the dough and fruit. – Place the pie pan on a parchment lined baking sheet and bake in a 400F over for 40-45 minutes or until crust is golden brown and filling is bubbling. Blueberries are not something commonly grown in these parts but I had found these local blueberries (grown in our mountain region) in the market before. They are not as sweet as the bigger blueberries grown in the Western world and I sometimes suspect that they are a strain of wild berries and not actual blueberries as we know them. In any case, they added a nice tartness to the pie that I liked. There is something about fruit pie — the fragrance it gives your home while it’s baking, the warm fruit, the buttery-flaky crust, the whole domestic goddess feeling you get while taking it to the table — that just sets you in a circle of comfort and home-and-hearth good spirits. Most welcome at any time of the year, but most especially when the weather is glum. So if you, like me not too long ago, are a bit apprehensive in the kitchen, why don’t you give it a go? I promise it’s not too hard, and can actually be loads of fun. And one day soon fulfilling you cravings will be as easy as, pardon the horrible pun, pie! A gorgeous pie! It looks so divine. Oh my, yum! My mouth is watering. I totally agree on the satisfying your cravings part. It's the best thing about cooking! mmmmmmmm pie and coffee, I love it. oh i totally agree with you! i used to eat out ALL the time just coz I constantly crave for certain food…but when i discovered that it's actually possible to re-create something similar in my own kitchen…it's like a whole new 'world' opened up for me hehehe. that galette looks stunning and so comforting. and it is still on my list of to-makes! I like your outlook Jo – maybe subconsciously that's why I am also drawn to cooking – because I can satisfy my cravings almost anytime now. The pie sounds lovely. Hi Carlos! Definitely good with coffee! I adore nectarines and blueberries in a fruit salad. This pie looks really inviting. Hi Sally! I like nectarines in salads too…grilled nectarines with pancetta or prosciutto and mozarella is one of my faves! I can't think of a better combination than peaches and blueberries! What a beautiful looking pie. All that fruit sounds delicious. simply staring at this pie is making me happy 🙂 cheech, you are so inspiring…i must unearth all my baking tools! Hi Katiez! It is the first time I’ve tried this combination and I must say that it really is delicious! Hi Maiters! Thank you…you are too kind my friend! Pie always makes me happy 🙂 Can we see each other soon please? Miss you! O you are so right and yes, that is definitely a very good reason to get into the kitchen! Your pie looks amazing and now I have to go and check out your oliebollen! It's amazing isn't it? We can travel the world (almost) right from our kitchen. And with so many ethnic grocery stores available in larger metro areas the possibilities are endless. Yesterday I posted about my Mediterranean Parfait – which (I think) is my own concoction. But were it not for the Travel Channel and a show Tony Bourdain did in Greece awhile ago – I never would've dreamed it up. Some foods just aren't available here. On a vacation I took to Paris a few years ago I was bowled over by the velvety smoothness of the least expensive glass of red wine in a bistro. And a certain white cheese on top of a salad left me clamoring for more. It's been a long time since that trip and I still wish I could find it. Happily there is so much we can create in our kitchens with ingredients that are readily available and that's a very good thing. Hi Denise! Definitely happy that we have so much more available to us now…especially Greek yogurt! Got here while I was googling for a place to eat in Tagaytay 🙂 Love your blog! Anyway, that pie looks heavenly! That's a really nice looking pie and I'm sure it's deliciouusss! Right you are… it's great to be able to cook almost anything you want. That is what I am afraid of. Like you and many home cooks, we have the power and we have to control it especially where the baking department is concerned. Both sides of my children have history of diabetes so I try to control myself from baking too much. Very hard to do especially with bloggers like you. I bet you can't order anything like this from any restaurant around Manila. And to eat something literally out of the oven, it's quite an experience, don't you think? Hi Anon! Freshly made and home made are definitely special! Hi Anon! So sorry! I meant 3/4 quantity…meaning half the recipe plus a half of the remaining half. I usually make one quantity and use it for two free form tarts, but since this pie has a kind of half upper crust as well I used half of the remaining half (and the remainder of the dough I freeze to make a smaller free form tart later on). Hope that makes sense and clarifies!